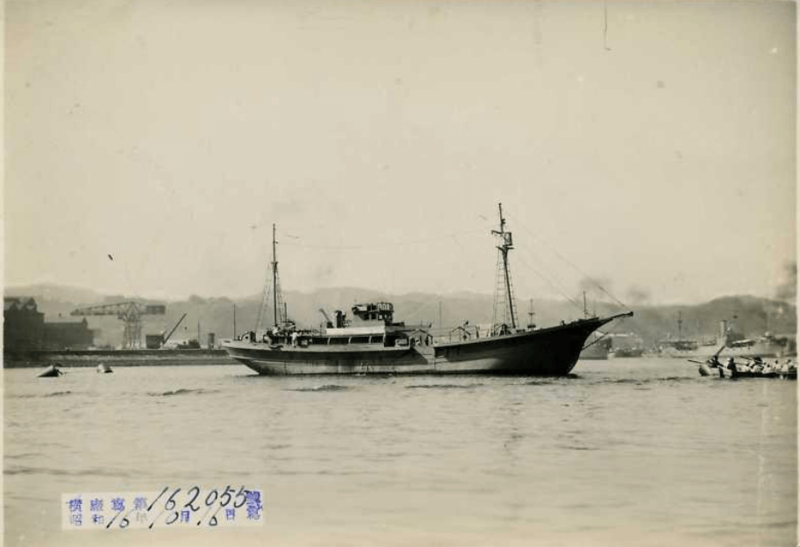 HF: This article might be read together with our article, BAAG Report KWIZ#3, Naval Reports, linked below, which mentions that the Manshu Maru, was the first auxiliary sailing vessel built and equipped in Hong Kong, and given its first trial run on 13th April 1943. I had never come across auxiliary sailing ships before, and I asked Stephen Kentwell, who recently left a comment to an earlier BAAG report article, if was able to provide further information about such vessels, particularly as the Manshu Maru appears to have been built at a Hong Kong shipyard. Stephen kindly said he would contact Peter Cundall who is an expert on the deployment of Japanese vessels in WWII in the hope that he might be able to assist. Peter could and has. Peter Cundall: I can’t add much that is definitive but can set some context. From 1942 the Japanese began to develop a wooden hulled standard ship program. Initially the intent was to operate the wooden boats locally and short sea (Kinkai) presumably to replace steel tonnage requisitioned by the Army and Navy. As the war progressed the wooden ships sailed much further afield and were actively requisitioned by the Army, to use for example in the Solomons and New Guinea once Allied superiority became evident (after November 1942). Wooden ships were smaller targets and often able to hide up in creeks etc in the daytime. They supplemented the commonly used landing barges (Daihatsu and Shohatsu) which was the main troop resupply source. The No. 1 type war standard wooden ships were in 5 sizes being 70, 100, 150, 200 and 250 gt. A derivative of the 70 ton coming in at 60 tons was also built. As the war progressed the program design was simplified to 3, being 100, 150 and 250 tons. According to Japanese records 2378 wooden standard ships were built during the war starting with 695 in 1943. The vast majority of these were built in Japan, with some built in Chosen. The ships were variously called motor sailboats, small cargo, and auxiliary sailing ships. To supplement the above the Japanese co-opted local shipbuilders on the China coast, French Indo China, Philippines and Dutch East Indies to build wooden ships which were then chartered, They were manned by locals but if engaged on military supply work would have a Japanese Master and possibly 1 or 2 other Japanese personnel- many of these came from the Imperial Japanese Army (IJA) (soldiers being used as sailors). In addition to these the Imperial Japanese Navy (IJN) had a wooden ship building program with the ships called Kotsusen (reported in Allied sources as Communications Boat or Shuttleboat). The earliest number Kotsusen I have is No. 26, the last 849. While this does not mean 849 were built it does indicate the enormous scale of SE Asian wooden shipbuilding, particularly in the late 1943-early 1945 period. The exact numbers built are unknown and will almost certainly never be known. Unless built for the IJN, most wooden boats built locally were given local names. Manshu Maru being built in Hong Kong may have been something of an exception in this regard. It seems probable, but information is so scanty it is hard to tell, that they roughly followed the designs of the standard program in many cases but probably with local design variations to reflect local boat building practice. In the case of the Manshu Maru I have records showing a ship of this name, described as “small cargo”, was sunk by gunfire by British submarine HMS Spiteful on 14 December 1944 NE of Kupang, Timor. Timor is a long way from Hong Kong but it is quite probable it is the same ship given that these ships were often ‘sent south”. There are two other possibilities of the same name. One is highly unlikely- this was a 7 ton ship on the Palau register (No. 166). In all probability this ship was too small to leave Palau (except as deck cargo) and was likely sunk in the 30/31 March 1944 air-raids there or subsequently abandoned. The other is a 29 ton Chosen (Korea) registered wooden cargo ship on Chosen register No.1605 (NB not an auxiliary sailer). Again this seems unlikely as few ships under 50 tons were sent south from Japan and Chosen. Also the last time the ship is shown in a register is 1939- it is possible the ship was lost prewar. While there are numerous photos of wooden sailing ships- many being gun camera shots while under air attack – there are actually very few photos that identify specific ships. The Manshu Maru is a case in point. The photo below is of a typical mid-size wooden sailing ship the Kompira Maru No. 8. While I have photos of war built vessels these are not as good, and the appearance and layout was little different to that below. (Kompira is the fishing deity in Shinto Japan and was a very common name used, like Ebisu and Sumiyoshi).